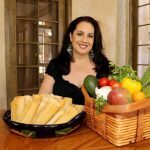 Tamale Cooking Demo + Savory-to-Sweet Tamale Tasting led by CasaQ Hispanic Lifestyle Expert, Darlene Tenes. This program is in support of the exhibition “Inspired by Juana: La Doña de la Frontera” appearing in the Museum’s Main Gallery, noon-4pm, Thursdays-Sundays, October 18 to March 31, 2019. Select the type and number of tickets below. We ask that you provide the full name of each attendee. Ticketing is closed for this event. The History Museum complex is admission FREE. Closed New Year's, Easter, Fourth of July, Thanksgiving, Christmas Eve and Christmas days. © 2019 Los Altos History Museum. The Los Altos History Museum is a registered 501(c)(3).